Peace! Now! And how to find it. Estimated read time: 30 seconds. You just got a bonus minute to use for a simple pleasure! Speaking of weird little processes. Crabapples! You life is full. Many days, maybe most days, you run from meeting to meeting, checking your email and texts as you walk. Or your mind is full of your to-do list or what you will say to that person when you see them. Not to mention taking phone calls in your car (tisk, tisk). Stress. Busy-ness. Yikes! When I worked for a big company our campus was huge. I was back and forth through the halls multiple times a day. And then spring would arrive, and I would detour myself through a particular parking lot. There was the most glorious crabapple tree at the end of that parking lot. I would stop, stick my nose right into those blossoms and sniff. 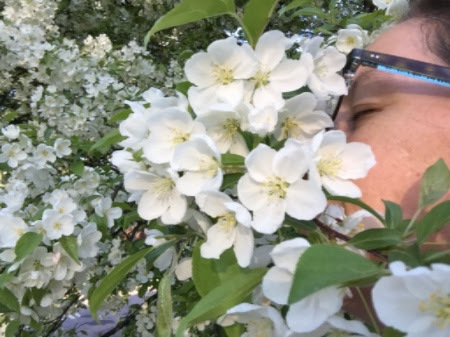 The marvelous smell of crabapple flowers was enough to propel me forward into even the most stressful meeting. With just a few seconds, you can find more peace.